Now that winter has hit us in full force, and the hustle and bustle of Christmas is behind us, many of us are looking for ways to keep busy as we await the arrival of spring. If you are one of these people finding yourself in a winter rut, perhaps rock painting might be the answer. Thunder Bay Public Library is happy to be partnering with the Thunder Bay Rocks Group, and hosting a community program called Happiness Rocks. 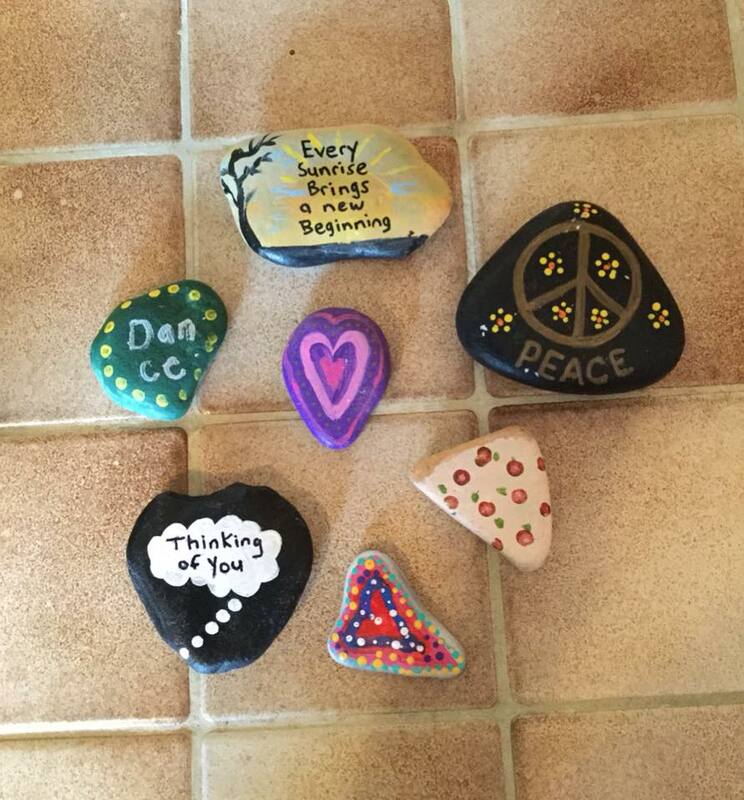 Join us as we get together to share ideas and inspiration, and paint rocks to spread around the community with the intention of brightening people’s days. 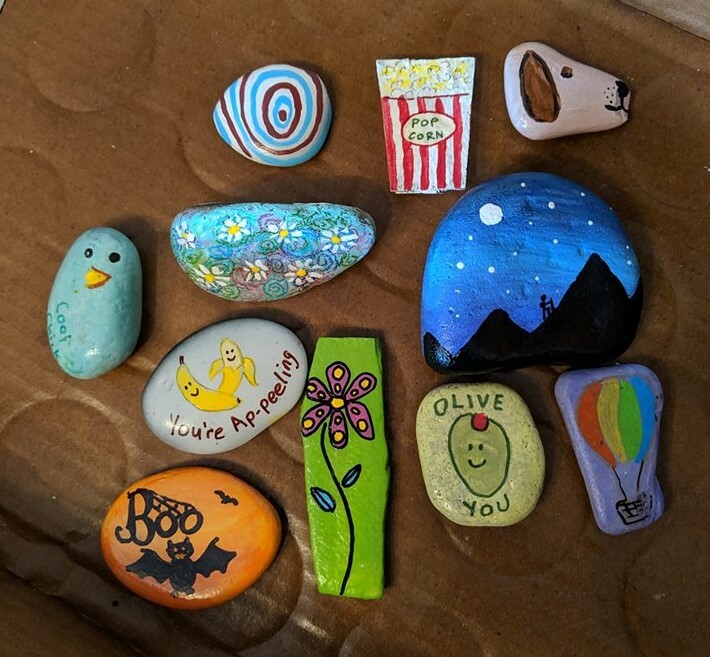 Considered “random acts of art”, rocks can be hand-painted with bright colours, positive images, intricate designs, simple messages, or inspirational quotes and left in public places for total strangers to find. Rock hiding groups have been rising in popularity world-wide, and since its inception in September of 2017 the Thunder Bay Rocks Group has already surpassed 1,700 members. Although the concept of painting and hiding rocks is quite simple, the rewards are plentiful and significant. Because it is an activity that can be enjoyed by all ages from toddlers to seniors, it is a perfect way for friends and families to spend quality time together. It is a relatively inexpensive way to encourage creative expression and relaxation, and it gets people outside exploring their neighbourhoods. Perhaps, however, the most rewarding aspect is the sense of community created by sharing your creations with total strangers, and promoting random acts of kindness. Although the purpose of this project is to spread happiness to random strangers, and create a sense of well-being in the community, those who use social media take it a step further by posting rocks they’ve hidden and rocks they’ve found on Facebook. Doing so enables participants to track their rocks, and experience the impact they’ve had on others. While most have been found and hidden around the city, many have also been tracked around the world – most recently in places such as England, Mexico, and Hawaii. Registration is required, and opens up 2 weeks before each session. Please call 345-8275, or log onto www.tbpl.ca/onlinecalendar to sign up. Together we can make the world a happier place one rock at a time. Heather Miller – www.tbpl.ca. If you have a comment about today’s column, we would love to hear from you. Please comment below!